A family of materials with an ability to change few of its original properties by the application of an external stimuli, such as moisture, pH, air are called Smart Materials. Some of the materials which include in this class of materials are pH-sensitive polymers, halochromic materials. Smart materials are lifeless materials that assimilate different functions such as sensing, actuation, logic and control to adaptively react to alterations in their environment to which they are exposed, in a constructive and mostly recurring way. Halochromic materials change their color in response to change in acidity or basicity.The scope of application of smart material includes solving engineering problems with unattainable efficiency and provides an opportunity for creation of new products that generate revenue. Worldwide considerable effort is being deployed to develop smart materials. The technological benefits of such systems have begun to be identified and demonstrators are under execution for wide range of applications from space to aerospace, to civil engineering and domestic products. The technologies using smart materials are useful for both new and existing constructions. Of the many emerging technologies available, the few described here need further research to evolve the design guidelines of systems. A halochromic material is a material which changes colour when pH changes occur. The term ‘chromic’ is defined as materials that can change colour reversibly with the presence of a factor, here pH. Halochromic substances are suited for use in environments where pH changes occur frequently, or places where changes in pH are extreme. Halochromic substances detect alterations in the acidity of substances, like detection of corrosion in metals. Halochromic substances may be used as indicators to determine the pH of solutions of unknown pH.The colour change of halochromic substances occur when the chemical binds to existing hydrogen and hydroxide ions in solution. Such bonds result in changes in the conjugate systems of the molecule, or the range of electron flow. This alters the amount of light absorbed, which in turn results in a visible change of colour. The various shades result from different concentrations of halochromic molecules with different conjugate systems. 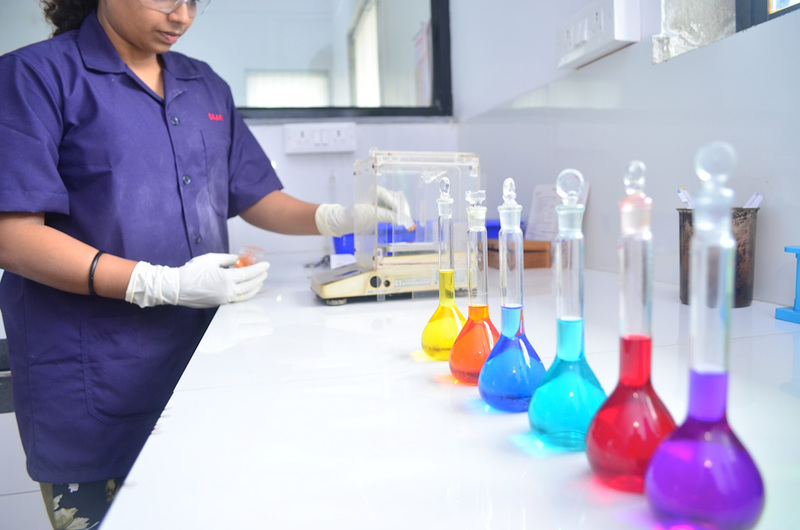 Some of the most useful halochromes manufactured by us are Thymol Blue, Bromothymol Blue, Bromophenol Blue, Bromocresol Purple, Methyl Red, Phenol Red, Methyl Orange, Thymolphthalein, o-Cresolphthalein, 1-Naphtholphthalein, Neutral Red, Bromocresol Green, M-Cresol Purple, p-Xylenol Blue and 2,6-Dichlorophenol Indophenol Blue Sodium Salt. A Metallochromic indicator is an ionochromic dye that undergoes a definite color change in presence of specific metal ions. It forms a weak complex with the ions present in the solution, which has a significantly different color from the form existing outside the complex. Metallochromic indicators are also known as pM indicators.In analytical chemistry, complexometric indicators are used in complexometric titration to indicate the exact moment when all the metal ions in the solution are sequestered by a chelating agent (most usually EDTA). Such indicators are also called metallochromic indicators. The use of these Indicators was limited to analytical testing until recently. There is a continuous effort to develop large scale applications of these Indicators for various consumer purposes like Water Hardness Kits, Anti-Corrosion Paints, Ophthalmology, Ready-to-use blood testing kits for determination of minerals in living bodies. Some of these Metallochromic Indicators manufactured by us are: Alizarin Complexone, Calcein, Calcon, Calcon Carboxylic Acid, Eriochrome Black T, Calmagite, o-Cresolphthalein Complexone, Hydroxy Naphthol Blue, Methylthymol Blue Complexone, PAN (Pyridyl-azo-naphthol), PAR (Pyridyl-azo-resorcinol), Phenolphthalein Complexone, Sodium Diphenylamine Sulfonate, Barium Diphenylamine Sulfonate, Thymolphthalein Complexone, Xylenol Orange Tetrasodium Salt and Zincon Monosodium Salt. The application of Halochromes or commonly known pH Indicators are demonstrated below in a series of different videos.